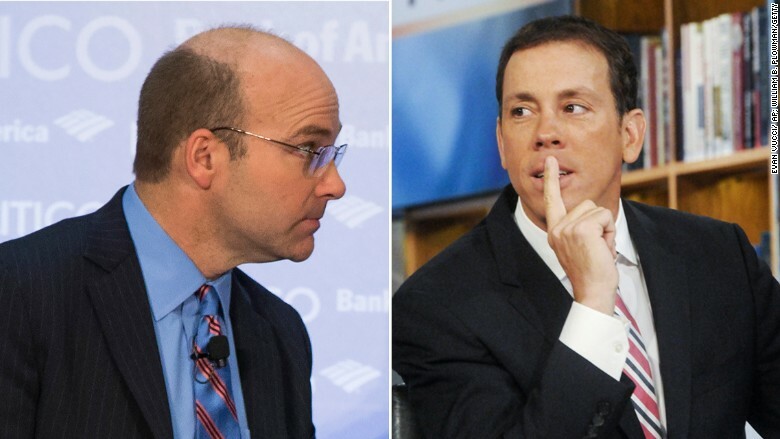 Mike Allen and Jim VandeHei are leaving Politico, according to sources. Politico is about to undergo the biggest shakeup in its 10-year history. Jim VandeHei, the co-founder and CEO of Politico; Mike Allen, author of the influential Politico Playbook; Kim Kingsley, the chief operating officer; Roy Schwartz, the chief revenue officer; and Danielle Jones, an executive vice president will all leave the company later this year. Susan Glasser, Politico's top editor, will step down after 2016 and take on a strategic role with Politico as director of editorial innovation from Jerusalem. Glasser is moving to be with her husband, a New York Times reporter who is being promoted to Jerusalem bureau chief. John Harris, the editor-in-chief who co-founded Politico with VandeHei in 2006, will take over at Politico's helm for the time being. The shakeup brings an end to a decade in which VandeHei, Harris and others built Politico up from scratch, turned it into one of the most aggressive and robust political news organizations in the country, and then reached beyond with expansion efforts around the United States and in Europe. Most notably, Allen's Politico Playbook became the must-read morning tipsheet for the most influential Washington insiders and political junkies. For its success, Allen was labeled by the New York Times Magazine as "the man the White House wakes up to." In recent years, however, Politico was plagued by what several insiders described as a crisis of vision and a leadership void. During Glasser's tenure as editor, dozens of staffers left the company to join other news organizations. VandeHei clashed with Politico publisher Robert Allbritton over budget issues and expansion efforts. And founding leaders, including Harris, largely receded to the background as they became more involved in Politico's expansion to Europe. Nevertheless, in a memo to staff on Thursday, Politico publisher Robert Allbritton said the moves made "perfect sense for the publication," and promised a hopeful future: "We are about to experience the most exciting, and I expect most enjoyable, period of expansion in ten years. With our revenue rapidly expanding, I am eager to make robust new investments in editorial quality, in technology, in business talent, and in new markets that we have not yet conquered." In his own memo, VandeHei touted Politico's achievements: "Together, we did this," he wrote. "We created one of the most respected and feared brands in journalism -- and one of the few with a business model based on real results, not mythology or hope. Our editorial and business formulas, culture and management approach work and scale exceptionally well." VandeHei, Allen and Schwartz will stay through the 2016 election. Kingsley will leave in the early summer. Jones will leave before then. Full disclosure: This reporter was a Politico employee until joining CNN in September 2015.